– Mix around. Marinade above 20 minutes. Asparagus is Steamable Frozen Bag. 1/8c Gherkins, sliced into 1/3rds. PHOTO does not do this justice. We were HUNGRY and it was late. Hence the one and done photo. No worries, we will be making it again, soon, it was AMAZING!!! On both sides of steak, LIGHTLY/BARELY, brush Steaks with Dijon Mustard. Season with Pub Season. Then, lightly, with Broth Base Seasoning. Roll up Steak, place in bag, marinade. Sautee Peppers in Oil with good shakes of Oregano and a shake of Pepper. Unroll and beat steak out to thin layer. Top with line of Sauteed Pepper Mix. Roll, use toothpicks to hold in place. Oil Pan, Sear each side. Top with Amazing Avocado Sauce. Eat. Vigorously, whisk Egg, Dijon, Oil. Separate dish, combine Rinds, Flour, and Seasons. Toss Beans with Egg Mixture, press into coating. Add to air fryer. Allow to set a few minutes to moisten. Then, I hit the Chicken Drumstick Button. Amazing meal for Thanksgiving or Christmas! Everything you need in 1 post! Pour Turkey Juices into a bowl, separate the fat off the top. Reserve both. Allow Turkey to sit in Room Temp for a lil bit. Make Butter Rub (I melted Butter and added rest. Put in Freezer til it was form-able.). Roll Butter Rub into ball. Place under skin. Slightly rub around (It will melt down as it heats). Roll lil balls and place into Leg Skin, as well. Pour Broth Mixture over Turkey. I reserved a LIL teaspoon of Butter Rub, melted some, and rubbed around turkey skin. In Turkey Cavity, add in some Onions and 1 half of lemon (Stab with knife around skin). Cook Turkey in Roaster at 450 for 30minutes. Then, 325 for the rest (15min per pound of Turkey). Stuffing: Mince Liver. Cut up Turkey Neck. Put slices in Gizzard. Add Butter to pan. Saute Turkey Neck and Gizzard. Add in Liver and Vegis. Saute. Add in Broths. Bring to Boil. Then, Simmer til all’s cooked. Remove and Cool. Add to fridge until it’s time to remove juice from Turkey (Next step). Once ready, bring to boil. Remove Neck and Gizzard. Add in Stuffing Boxes. Toss, add Sea Salt. Cook/Bake to desired texture. Last 30min, or so: I dump the Juices from the Turkey Pan (STRAIN and reserve BOTH Vegis and Juice!!!). Cover and set Vegis aside. Skim, and reserve, the fat off the top of juice. You will need 3-5T skimmed Fat and 2c Broth/Turkey Juice for Gravy. Toss rest. (Use Butter to compensate for lack of Fat, if needed). Drizzle 1tsp Olive Oil over Turkey. Sprinkle Turkey with Lawry’s Seasonal Salt, Garlic Powder, Onion Powder, and Paprika. Place back into Roaster (I removed inner pan.). Roast at 325-400 for additional 30min to an hour. Gravy: Add to pan, 5T skimmed Fat, add Butter to compensate. Heat, adding in 5T Flour. WHISK, continuously, until a nice brown. Add in Turkey Juices, Bay Leaf, and Sea Salt. Whisk continuously til desired thickness. Keep in mind that it thickens as it cools. Remove Bay Leaf after it sets a few minutes once completed. Allow Turkey to rest about 30minutes, slightly uncovered. NOTES: For Broths, I used Cubes and Water! Premix Burger Mix (First 11 Ingredients). Marinade 1 hour in fridge. Premix Sauce Ingredients, place in fridge til use. Nicely Pepper Bacon Slices. I Bake til crispy. Set aside, covered, til use. Grill Burgers (Awesome on Charcoal Grill, if done right). Right off the Grill, top with Cheese (I used Velveeta Jalapeno Cheese, not a lot, just enough). Top with Bacon and other Toppings. Be sure to use Tay’s Cowboy Jalapeno Sauce! With FRIED ONIONS, Tomatoes, More Jalapenos, and optional: Ketchup/Mustard (I did Ketchup/Mustard on one Bun, and loaded the Cowboy Jalapeno Sauce on the other Bun). Great Fall Time Man-wich! Get your Eat On! Butter Flavor Cooking Spray Crock Pot. Add, and stir, Apple Cider, Broth Cubes, Smoke, Sugar, Cinnamon, Pepper, Garlic Powder, Onions, and minced Garlic in Crock. Cook on Low 6-8 hours. Shred Meat. Reserve 1/3c Cooked Juices. Toss rest of Juice (OR SAVE for serving time sandwich DIPPING!). Mix together 1/3c Reserved Juices with the Honey BBQ Sauce. Add Shredded Meat to Crock. Stir in BBQ Mixture. Cook on Warm or Low for 15-20 minutes. Serve on Buns with a drizzle of Tay’s Mustard Sauce (Recipe right below). Leftovers are great on Soft Shell with: Tay’s Mustard Sauce, Sour Cream, Salsa, and Cheese. Butter Flavor Cooking Spray Crock Pot. Add, and mix, Beef Broth, Chipotle in Adobo, Garlic, Cumin, Onion Powder, Pepper to Crock. Add in Meat. Cook on low 8 hours, turning around in juices. Shred up. Reserve 4T of Juices. Discard rest. Mix Sauce. Add to shredded Meat. Keep on Warm or Low for about 15-20minutes. Serve on Buns of Choice. Heat Oil about 375-400. Break of pieces of Dough and stretch out to about palm size. Deep Fry (I use deep fryer grated bowl to help hold dough in oil, helping to fry flat). Brown each side, place onto paper toweled plate. Season with a Garlic Powder and a lil Garlic Salt. Top with Eggs and Sausage Mix. Pour on Gravy. Toppings of Choice: We just did Pepperoni. But, options: Onions, Peppers, Jalapenos, Olives, etc. Add Pepperoni to Soft Shells. Top with Cheese, Grated Parmesan Cheese, Seasons, and other Toppings of Choice. Roll, tucking in sides. Heat Skillet. Spray both sides of Wraps with Butter Flavor Cooking Spray. Brown each side. Sprinkle LIGHTLY with Garlic Powder. Serve with Sauce for Dipping. DON’T FREEZE MEATS that have been Frozen then already Thawed! Boil in water with few CRUSHED chicken broth cubes. Remove chicken, shred. In bowl mix Sauce ingredients. Mix in rest. Place in tightly sealed container. KKEP COLD! Eat within week. PreCooking: Cube Potatoes. Mix Olive Oil with Seasoned Salt. Add to pan, add Potatoes. Cook and Season with Oregano, Basil, Pepper. In sep. pan cook Sausage with Pepper Mix and Mushrooms. On Soft Shell add All (Including Mayo, Shredd. Cheese). Butter Flavor Cooking Spray skillet. Brown all sides. Freeze single layer on plate sprayed with cooking spray (Don’t allow to touch, may stick). Wrap in Foil if using Crockpot Cooking Method (May need to Butter Cooking Spray Foils before wrapping!). Cooking: Rub with wet finger. Microwave. Bake: Butter spray pan and tops. Bake. Or, place pre-prepped Burritos in foil that was SPRAYED WITH BUTTER FLAVOR COOKING SPRAY. Wrap. Freeze. Add to Crock and Cook on Low/Warm til warmed through. Rotate if needed. Potatoes fried in Crisco (What we had for Fish fry, if we caught any), seasoned with Pepper, Basil, Oregano, and a lil Salt. Side Aside and top with Sandwich Cheese Slices and Onions (Onions Optional). Cover to melt. Give light wipe of Pan with Paper Towel. Cook Sausage. In same pan, in Sausage Grease, fry up some Eggs. Pork Sausage served under Eggs. Look at those about to Burst Yolks! Simple… You know how to cook. PrePrep: Buy Chicken NON FROZEN!!! REMOVE SKIN! Place Chicken and Vinegar into ziploc bag. Mix Around. Add in McCormick’s Seasonings. Toss evenly. Lay Flat, Freeze! Cooking: Thaw, cook on Grill. Near end, brush with BBQ (Optional. Tasty plain, too). -MIX ABOVE INGREDIENTS IN Miracle Whip container. PrePrep: I premade sauce morning of trip. For leak reinforcement: I placed some plastic over top of Miracle Whip jar (I used ripped sandwich bag. Reinforced seal), twisted on top. Keep cold til serving. About 1 hour prior to serving: Cook Bacon. Cook noodles (I add pinch of Salt and a lil Oil to keep from sticking). Mix Sauce and Bacon together. Add Noodles into Sauce, to consistency desired. Toss rest. I always have it a little saucy, as it’ll sit and absorb some. Keep cold til serving. OPTIONAL to top with Cherry Tomatoes for Serving. You can also keep the Miracle Whip unopened, and place pickle juice and Seasoning in a small container and place into Noodle Box, place in fridge on arrival. Mix as needed. Your choice. 1-2T Butter per packet, we forgot, and a smidge of Crisco worked well! Prep: We buy a pkg. of Frozen Burger Patties, and KEEP FROZEN til use. Doubles as ice for cooler. Cooking: I cut vegis at cooking. Dice potatoes and cut onions. Give each person foil. Kids love making their own! Add in desired vegis. Top with butter or crisco. Add one frozen burger to top. A small sprinkle of onion pkt. seasoning. Double or triple wrap. Add to hot fire pit coals. Ours cooked in about 45 minutes (Time varies). Rotate, we didn’t flip! Rest of burgers we had for supper another night. We also ate leftover Tuna Salad with this meal. – FRITO TACO SALAD, a ritual for a while now. 2 GOOD Taco Season Pkt. Serving: Serve with tomatoes (Canned works), fritos, sour cream, shredd. cheese, lettuce, whatever other toppings of choice. PreCooking: Cook beef. Add in taco seasons, beans, salsa, tomatoes with juice, shakes of: Garlic Powder, Chili Powder, Onion Powder. Allow to cool. Place in freezer bag (I double bag), lay flat. Cooking: Throw into crock. (I kept on warm, flipping.) Serve with toppings of choice. I cut my links into chunks (Can remove casings and cook as ground). Cook in Oil with Onions. Add in Garlic and Vinegars. Cook down some. Add Olives, Peppers, and Pepperoncinis. Cook down juices. Once juices are mostly gone, add in rest of ingredients. Simmer a lil bit. ONCE COOLED… Add to Ziploc Bag, on it’s side. FREEZE. Cooking: Add Regular Beef Meatballs to Crock with Sauce. Cook on Low. Top with Cheese last 30min-1hour. Serve on Buns/Wraps/Hoagies with Cheese… We used Hot Dog Buns. Mayo/Miracle Whip is Optional. Cook all above. Once cooled. Add to ziploc bag, lay on it’s side, for flat storage. Freeze. Cooking: Add to Butter Flavor Cooking Sprayed Crock… Cook on Low or Warm til thawed and heated through. Eat on Bread or Buns. Cook in skillet all above, EXCEPT Peppers, Onions, and Provolone. Once cooled, add to ziploc bag. ADD IN Peppers and Onions. Lay on side (I folded mine in half). Freeze. Cooking: Cook on Low or Warm til heated through. Top with Cheese. Once Melted, serve on Buns of Choice with Miracle Whip/Mayo. Or try packing away a small container of Tay’s Balsamic Garlic Sauce. Add NON FROZEN Meat to Bag. Add in Marinade Ingredients. Mix Around. Lay as Flat as you can. Freeze. Cook Rice in Water with Broth Cubes (I cook in Microwave). Once Cooled to handle, place in Freezer Bag. I flattened and Folded. Freeze. In A SEPARATE Freezer Bag, Add in Vegis. Lay flat and Freeze. Cooking: Add all to Butter Flavor Cooking Sprayed Crock Pot. Cook on Low til all’s done. Shred up Meat. Last hour, I wrapped Rice in Foil and place RIGHT ON TOP of Chili to cook. Serve each bowl of Chili with a lil Rice, Sour Cream, Salsa, and Fritos/Tortillas. – Roast Wiches (Don’t Pre Cook. Add ingredients to freezer bag, MINUS Water that the Broth Cubes call for (Takes up too much room!). Write on Freezer Bag the amount of Water needed during cooking. OH MY DELICIOUSNESS! These are AMAZING! Easy to Make. Grill, Bake, Stove Top. Or, even cook as Camping Foils (Right on the Hot Coals). Butter Spray Foils. Lay in Bacon. Top with Asparagus, then Mushroom. Sprinkle over Onion Pkt. Powder, then Pepper and Salt. Wrap up in Foil. Bake or toss onto Grill, as we did. Once all’s cooked/Soft. Eat! Brown Beef, drain excess juices, if needed. Add in Packet, Season, Sauces, Ketchup, Water, Vegis. Simmer til thick. Top onto Bun or Wrap of Choice (We used Joseph’s Flaxseed Flatbread). Notes: I add a little more Minced Celery at end, for a nice crunch. Tasty. Marinade Meat. BEST ON CHARCOAL GRILL! Cook. Cut up to desired size. Mix all ingredients into bowl. Add Meat (Or mix in with Salad Ingredients). Add in Dressing (USE CILANTRO LIME RANCH!!!). Top with Croutons/Tortillas (And, Citrus Avocado Sauce, if using). EAT! Charcoal Grilling Tip: If it tastes like straight up smoke… You’re doing it wrong! We build a hill in center of grill. Light charcoal (We used Regular Charcoal). Once coals are ashy grey, they are ready. Place on food, on outside of hill of charcoal. Prop Grill Open, using a Slightly crushed pop can. Chicken: Lay Chicken on outer part of grill (Outside hill). Once Chicken isn’t sticking to grate, so much, it’s ready to flip. Flip once, that’s it. Cook til Thermometer reads correct temp. Tay’s Balsamic Watermelon Strawberry Salsa – And, a few ideas for it! Including EASY & HEALTHY Pizzas! Toss all. Allow to Marinade 20 minutes. Ideas for Use: Salsa for Chips. Salsa for Sweetened Shells (Fry Soft Shell in Butter. Toss in Sugar and Cinnamon.) Serve as Topping for Wrap, Sandwich, Balsamic Burgers, or Quesadillas. Or, as we did… MAKE Taco Shell Pizza. I marinaded Chicken 1hr. Cut up. I added Avocado Oil to skillet. Cooked Chicken, if excess juices- Drain it, to help crispify (Especially, for Bacon). Add in Bacon to Chicken. Cook all (Draining excess juices, if needed). Cut up all to smaller pieces. Or toss all in Oven, Bake. Bake, uncovered, at 450 for about 8 minutes. AMAZING Dish! With a SECRET Ingredient! Most know of the Italian Salad Recipe. This one has a few things that make it STAND OUT! Plus, Lower in Calories, than most. PREMIX Sauce Ingredients. Set aside. Cook Noodles in Boiling Water with Salt and Oil (Oil helps noodles from later sticking). Drain well. Rinse with Cold Water, drain well, again. Be gentle. Add all to bowl. CAREFULLY MIX all Ingredients. Add to fridge til use. Please note, the longer it sits, the MORE the noodles will soak up flavor of sauce. Creating a less flavorful dish. Salami (Diced) in place of Ham… OR, Better Yet… BOTH! MEAT IS YOUR PREFERENCE! We used Turkey Pepperoni to cut Cals. It was AWESOME! Also, for Cheese, you can choose to do: 1/2c Mild Cheddar (Cubed) with 1/2c Other Cheese of Choice (Cubed). Salads DO NOT have to be Boring! Many ways to get those Vegis in. To Cut on some Calories and Carbohydrates and, yet, STILL BE SATISFIED! Here are just a Few of MANY to get the Idears rolling in! (Above 2 Photos) Loaded BLT Salad SUPER EASY to make! (Above) Loaded TAYco Salad (Loaded Taco Salad). AMAZING! For Recipe Click Here – Poppy Seed Salad Dish- Top over Bow Tie Noodles (For Pasta), or Coleslaw (Slawad), or Chicken (For Sandwiches/Wraps)! *** COMING SOON (Tonight or Tomorrow): Mandarin Pinto Salad, BBQ Pork Salad! So, check back! Healthier than most dishes Similar to this, using Turkey Meat. Preheat oven 400. Mix Sauce Ingredients. Butter Flavor Cooking Spray Baking Dish. Spread Warmed Cream Cheese on Bottom. Top with Meats. Top with Vegis, then, Sauce. Top with Croutons. Top with Shredd. Cheeses. I Sprinkled Top with Oregano, Grated Parmesan Cheese, and Pepper. Bake about 400 for about 45minutes- 1hour. Bone in Chicken, skin removed! Marinade Chicken. Grill or Bake (If baking, I cover for half the time. With foil.). When just about done. Brush generously with BBQ (Enough time in advance to allow to caramelize, if grilling.). Allow to set a minute or two. EAT! Eat As Chipotle Chicken topped with Citrus Avocado Sauce. Or, Shred and have yourself a Man-wich topped with Citrus Avocado Sauce! However you choose, these are AMAZINGLY Tasty! PREMIX Marinade, DON’T ADD TO CHICKEN, yet! I halved Chipotle Peppers. Premix Sauce Ingredients. RESERVE 2T Marinade (For later mixing). Place in fridge til use. I cut shallow slits into chicken, so marinade can get in there. Marinade Chicken (I used Bone In and removed Skin). Marinade 4-6 hours. Best on Charcoal Grill. Even Grill the Chipotle Peppers! They are GREAT! – Regular Chicken Breast topped with Citrus Sauce: Brush on Reserved Marinade. Top with Citrus Avocado Sauce. Eat. Don’t forget to Serve with Those Chipotle Peppers. For Serving (Optional, choose): Sour Cream, Salsa, Ketchup, Prepped Horseradish Sauce, Steak Sauce. Gently Wash and Marinade JUST the Mushrooms About 2 hours. Butter Flavor Cooking Spray Aluminum Pan. Line bottom with Asparagus, add in Rest, TOPPING with Mushrooms last. Sprinkle with Pepper. Best on Charcoal Grill. Cook til soft. Tossing occasionally, we only needed to do once. Optional to serve with Sauce or Nothing. We like it alone. Some like it with Sour Cream and Salsa. Some, Horseradish. Some Ketchup and Sour Cream. Some Steak Sauce and Sour Cream. Notes: You can amp this up with Meats. But, we wanted a Vegi Dish. Was AWESOME! Great Alone, on Tacos, for Salads (As we did), or over Rice (Mexi)! Amazing LOW CALORIE, LOW CARBOHYDRATES Chicken! AWESOME Flavor!!! 1 McCormick’s Grill Mates Baja Citrus Marinade Pkt. Amazing take on the Elote, Mexican Street Corn. Be sure to read notes for options. Marinade thawed Chicken 4-6hours (See notes). Mix together Creamed Corn, Chili Powder, Garlic, Paprika, and Mayo. Set aside. Butter Flavor Cooking Spray Baking Dish. Dump in Rice and Water. Sprinkle over Crushed Broth Cubes. Stir. Add in Corn, drained Black Beans, Onions, and Peppers/Mushrooms (If using).. Stir in Creamed Corn Sauce. Top with Marinaded Chicken. Cover with Foil. Bake about 425 for about 35minutes. Remove Foil, cut up Chicken, slight stir. Top with Shredded Cheese and good sprinkle Parmesan Cheese. Bake, uncovered, for about 10-15 more minutes. Serve with Salsa and Sour Cream! *** NOTES: Use 2 cans Creamed Corn instead of 1, and choose to skip Southwestern Corn. CHICKEN and Marinade IS OPTIONAL! You can just make this an Elote Corn and Rice without meat. Or, use Plain, unmarinaded, Chicken. Or, use your favorite Mexi Marinade/Meat. So, Marinading Step is optional! 4T Sweet MINI Bell Peppers, chopped. Cube Potatoes. Add Potatoes to ziploc bag. Add half Oil. Shake. Add in HALF Pepper, Creole, and Salt, shake. Add in Rest of Oil, then Season, shake. I allow to set/marinade 30minutes. Grill in Foil. (Or bake how desired). I premake Sauce, and set aside til use. You can eat this salad warmed or cooled. If cooled (As most are): Grill or Bake Potatoes. Set into fridge to cool some. Mix with Sauce, stir in Vegis, NO LONGER THAN 30 minutes prior to serving. Top with Egg Slices and Shredded Cheese. Optional to sprinkle top of Cheese, LIGHTLY, with Lawry’s Seasonal Salt, or More Creole. (I SKIPPED the extra salting). Notes: I add Sauce close to serving time, due to Potatoes Eating Up Sauce. More flavorful that way. Eat as is, with Toppings. Or, as we did, as BURRITOS! Marinade Chicken 5-6 hours. Butter Flavor Cooking Spray a baking dish. Lay in Rice, Water, Sprinkle over Crushed Broth Cube, stir in Taco Sauce. Stir in Drained Black Beans. Top with Chicken. Bake at about 425-450 about 35 minutes (Til Chicken is done). Cut up Chicken. Mix into Rice. Serve on Soft Shells with Pico, Sour Cream, Cheese, Lettuce, Taco Sauce. Enjoy! OR… Eat as is, topped with Toppings, skipping Shells. Optional Step: Roll up Toppings in Soft Shells. Butter Flavor Cooking Spray skillet. Brown each side of Burritos. This is an AMAZING Low Calorie Meal. That’s not only BENEFICIAL with Beans and Sweet Potato, BUT, AMAZING in Flavor. Great Chicken Marinade. EASY TO MAKE! This can be cooked Many A Ways! Even on Hot Camp Fire Coals! Eat as is. Or, topped with Salsa, Sour Cream, Cheese, and FRITOS. Or, on Shells for Tacos! Just Check Below for more options. Marinade Chicken, in ziploc bag, about 4-6 hours (I believe I did 5hr). Place Vegis into Foil. Drizzle about 1/2tsp-1tsp Extra Virgin Olive Oil over them. Season, WELL, with Oregano. Wrap Tightly. Place on grill a little before Chicken. Grill Chicken SEPARATELY, right on grate. Cook Rice in Broth (I do in Microwave, covered. Stirring half way). Eat as is. On Shells… Optional to serve topped with SHREDDED CHEESE, SOUR CREAM, and SALSA, (EVEN Frito Chips). Most liked mixing Chicken, Rice, and Vegis together. A few liked it separate. Cooking Option: Can be Baked! Butter Flavor Cooking Spray Baking Dish. Lay in Vegis. Top with Chicken. Cook Rice in Microwave or Stove Top (Can even stir Rice, Water, Crushed Broth Cube(s) in with Vegis for Baking). Cover with Foil. Bake til Chicken is done. Serve over Rice. TRY IN FOILS on Hot Camp Fire Coals for EASY CAMPING MEAL! 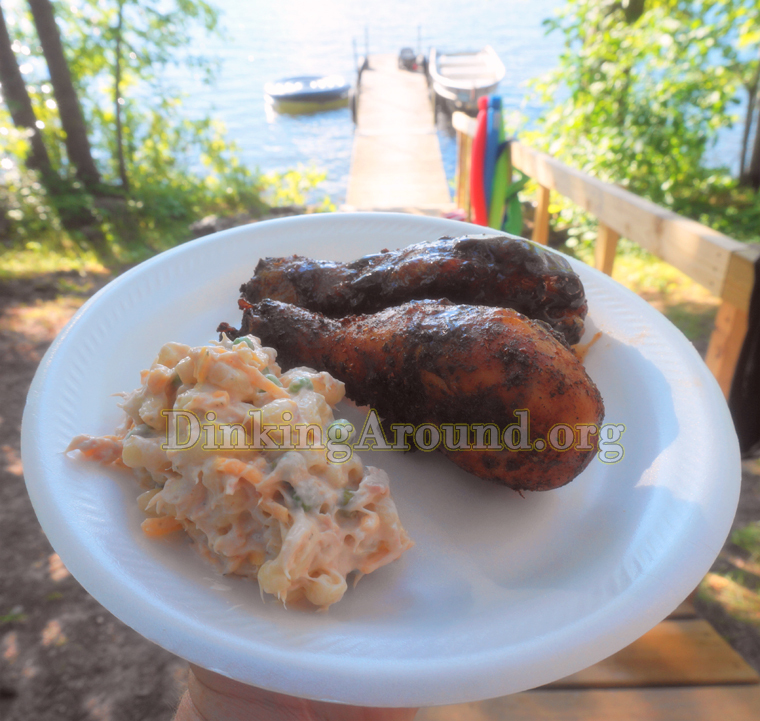 Marinade and Cook Chicken (Charcoal Grill IS BEST! ), shred. I also grilled the Vegis, in foil, separately with a lil Oil (1/2tsp), seasoned well with Oregano, and a good few splashes of Soy Sauce. Bean mix: Simmer in sauce pan a few minutes, to blend nicely. (For flexibility, place Corn Shells inbetween lightly damped paper towels. Microwave few second til more flexible). Fill with Chicken, Vegis, and a lil Cheese. Roll. I use toothpicks to hold in place. Top with Bean mix, then, Queso/Cheese. Bake, uncovered. I did about 425-450 for about 15-18minutes. For Recipe Click Here – Turkey Chorizo with CHIPOTLE Cranberry Bean Salsa -HEALTHIER! Whether you cook on grill, in oven, or on hot coals in fire pit (Great for camping)… These are AMAZING. And, pretty healthy! Tons of Vegis! Fiber in Beans! And, Beneficial Sweet Potatoes! Marinade 2 lb. Chuck Roast in ziploc bag. BEST ON CHARCOAL GRILL!!! In a bowl, mix ALL Vegi Ingredients. Add to foil (Ours used 2). Wrap tight. Grill Chuck RIGHT ON GRILL, and cook Vegis in Foil. Cut up Chuck. Top bowls with Vegi Mix, then Meat. Then, Toppings of choice. Potato Tip: Stab whole potatoes with knife about 3 times on each side. Microwave Potatoes (Whole) for few minutes (Depends how many I do 3-4/5 minutes). Dice up. Then, grill. Cuts cooking time and ensure those potatoes are soft through. DIRECTIONS: Marinade Chicken 4-8 hours. Toss Potatoes and Artichokes with a lil Oil (We used Olive). Place into Foil. Grill both Chicken and Potatoes (Separately). Add Potato mix to bowl. Top with Chicken. Top with Toppings and Cheese Mix. OR TOP ALL ONTO Pita Breads! -Or, Marinade Chicken, cut up. Add Chicken, Potatoes, Artichokes, Onions, and Olives to baking dish. Bake. Top with Toppings. -Cut Sweet Potatoes to fries, toss with Oil, season. Bake. Cook rest (Together or separately up to you). Top all onto Fries. Salt & Pepper Cucumber slices. I set into strainer in fridge for about 15minutes. Bring to boil, Vinegar, Water, and Sugar. Add Cukes to bowl. Pour over. Allow to marinate 1 hour. Sour Cream Version: Drain, reserving 1-2T Marinade. Stir in 1/3c Sour Cream with reserved Marinade. Cut Peppers and Onions. Place into Bowl or Ziploc Bag. Add in Marinade. Marinade 4-5 hours. Once done, Reserve 1-2T excess Marinade, toss rest. Butter Flavor Cooking Spray Baking Dish. Add in Rice, Water, and Broth. Add in marinaded Vegis, reserved Marinade, and Pineapple Chunks. Give a light stir. Top with Chicken and Shrimp. Season, WELL, with Lemon Pepper. Cover with Foil. Bake, at about 425-450 til Chicken is done. Mix Glaze (Maple Syrup and Dijon). Brush nice layer onto top of Salmon. Mix Seasons (Pepper, Cayenne, Paprika, Salt (If using)). Season, well, with season mix. Grill til flaky. Served with Sweet Mini Bell Peppers: Place into Foil. Grill. That’s it! Place Lemon slices onto grill (Optional). Lay Salmon onto Lemon Slices (Skin down). (Optional to add a Honey/Dijon Glaze). Season top, nicely with McCormick’s Lemon Pepper Seasoning. Grill. EASY to Make! LOW CALORIES LOW CARBOHYDRATES Sweet and Spicy Chicken Wraps with a Delicious Cucumber Tzatziki Sauce. Healthier never tasted so good! Marinade thawed Chicken Breasts 1 hour, mixing around every so often. (Great time to make Tzatziki Sauce.). This Chicken is BEST ON CHARCOAL GRILL!!! Cook Chicken. Once cooked, cut into strips. Toss Chicken with Sauce IMMEDIATELY. Optional to use Breaded/Fried Chicken to toss with Sauce, instead. Microwave Potatoes, covered (Cuts cooking time). Then, halve then. Butter flavor cooking spray them. Sprinkle, WELL, with Herb Garlic Seasoning and Pepper. Add Green Onions. Wrap in Foil. Grill. Italian Salad – LOW CAL. – LOW CARB. Add Frozen Chicken to pan of Water with 1-2 Chicken Broth Cubes. Bring to Boil. Boil til cooked. Cut up. Add in rest of Salad Ingredients. Top onto Wrap/Bun of choice, with Toppings of choice. Eat.